I mean, I’m not throwing boiling water into the frigid air and watching it instantly turn to snow, and I’m not creating masterpieces in frozen bubbles. Still, 50 degrees in South Florida is enough for me to break out the Uggs and the scarf. Truth is, even though I turn on the heat when the mercury drops below 70, I am absolutely prepared for any sort of catastrophic temperature drop because I am well versed in the science of disaster films. Forget studies and government analyses, forget geology and oceanic currents – you want to know what to do when the world is ending? Keep up to date with your disaster flicks. Zombie Apocalypse? Inject yourself with a virus. They’ll ignore you. Even if you’re Brad Pitt. Aliens taking over the Earth? Send a computer virus to their mother ship. Meteor crashing into the Eastern Seaboard? Lose the car and get a motorcycle – it can outrun the tsunami. But Catastrophic Climate Change? 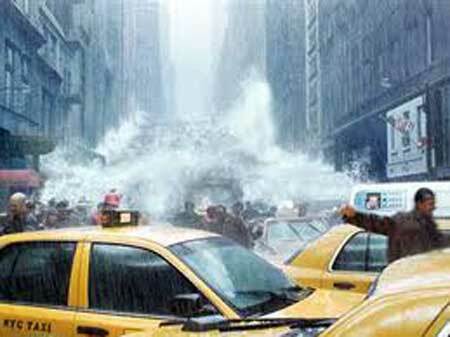 Look no further than The Day After Tomorrow, 2012, and even Knowing. How many of these life saving tips do you remember? If you are caught in the path of a severe cold weather storm that freezes helicopters and people as quickly as liquid nitrogen, get yourself to a Wendy’s. Their gas lines don’t freeze and will keep you toasty. If you need winter clothes, make sure you get to the library. They keep enough coats to clothe all of NY. Along the same line, the doors of the New York Public Library are strong enough to keep out a massive tidal wave and temperatures of 400 below zero. That’s the power of books, I guess. Don’t ever listen to the cops or the news or even the Mayor or the President. Instead, always rely on the teenagers from the Science Bowl. They survive. The cops, not so much. In fact, stay away from anyone over the age of 30 and hang with the teenagers or the good-looking people. Adults in disaster films are like the red-shirted guys in Star Trek. And you know what happens to them when they beam down to a planet. The exception to the teenager rule in point 5? Crazy people. Find someone psychotic and he or she will not only survive, but will have the answers that the government has been struggling with since the disaster started. Cell phones won’t work in New York, but if you are deep in a cave on a mountain in Nepal, your service will be crystal clear. And you’ll be able to call the pentagon. If you manage to evacuate, Africa is your best bet. Or Mexico. Stay clear of California, though. No question. Meanwhile, the temperatures seem to be going up, so I am hopeful the rest of the country will make it to spring. I’m not sure how much longer I can take these frigid 62 degree temps. Good thing I have smart teenagers to hang with, a gas stove, and enough disaster DVDs to learn all there is about surviving. ‹ That New Notebook Feeling – Happy New Year! Excellent, informative piece, Adina! But you left off one major one. Should there happen to be a massive land shift where the tectonic plates realign themselves, you’ll have no worries. They always move you to the exact spot you need to be. If you have a voice activated car, that is. Oh, and don’t cross the beams. articles, this time of year (the end of year holidays) is prime time for a pandemic outbreak event and a subsequent zombie apocalypse.